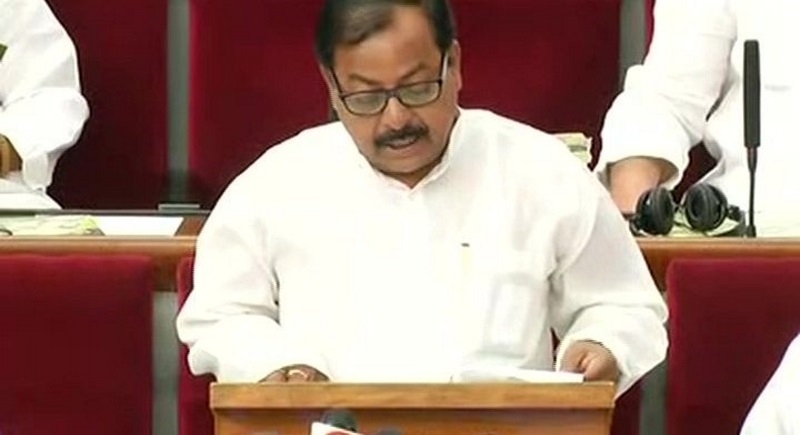 Bhubaneswar, Feb 8: Amidst protest by opposition parties, Odisha Finance Minister Sashi Bhusan Behera on Thursday presented a Vote-on-Account worth Rs 56,921crore for the first four months of 2019-20 fiscal while tabling an interim budget of Rs 1.326 lakh crore for the full year of 2019-20 in the Odisha Assembly. State's flagship scheme "KALIA" (Krushak Assistance for Livelihood and Income Augmentation) gets the highest allocation in this budget. As tenure of the current assembly is coming to an end on June 11, the new government will pursue appropriation for the full financial year 2019-20 after the general elections. Finance Ministry said, “Keeping in view the requirement of funds for expenditure on payment of salary, pension, interest, old age pension, scholarship for SC and ST students, a sum of Rs 56,921 crore has been proposed in the vote-on-account before the House to defray the expenses during the first four months of the financial year from April to July 2019”. While presenting the interim budget, Behera informed that Odisha has been able to achieve a better economic growth of 8 % which is way more than the national average of 7.1 %. The State government has been successful in doubling the farmers’ income and has launched KALIA scheme. As the state government has launched the State Food Security Scheme, to cover the left out beneficiaries under National Food Security Act, it has made a provision of Rs 1028 crore for supply of rice at Rs 1 per kg. KALIA (Krushak Assistance for Livelihood and Income Augmentation)- state flagship scheme- 4,461 cr. Rural water supply-Basudha scheme- 2, 935 cr. PEETHA (People Empowerment-Enabling Transparency and Accountability)- 400 cr. Madhubabu Pension Scheme- 2,120 cr. Mamata (Cash scheme for pregnant women)- 305 cr. Biju Swasthya Kalyan Yojana- 864 cr. Gopabandhu Grameen Yojana- 500 cr. Parvati Giri Mega lift irrigation- 1777 cr. Water sector infrastructure development- 1,465 cr. Road development programme- 1,300 cr. Biju Setu Yojana- 500 cr. Development of Railway project in the state- 410 cr. The full budget for 2019-20 fiscal will be presented by the new government after the upcoming elections.